Buying a home isn’t for everyone. I’m not saying that renting is better than buying--I don't think anyone likes the idea of writing a check for rent more than they do a mortgage--but sometimes renting is simply the smartest option on the table. 1) You can’t afford it. Getting approved for a loan and affording a home are two entirely different things. Sure, your bank just approved a hefty loan, but can you afford it? Will your BAH cover the mortgage? And if you move, do you have the extra income to cover the added expense of living, plus the mortgage should it not sell or rent immediately? 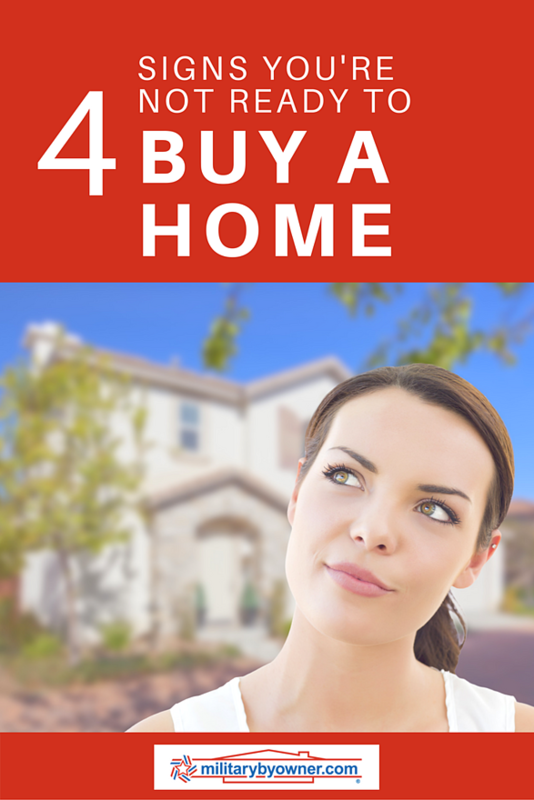 It’s important to keep your finances in mind as you consider buying a home. Just because your friends bought a beautiful home doesn’t mean it’s in your budget to do the same. Hopefully, you’re saving for retirement and investing a portion of your monthly income. If there’s not enough extra to put toward a mortgage and homeowners insurance, that’s okay. It’s simply not the right time to buy. 2) Your PCS orders are short-term. Many orders are written for two to three years. When you think about how long it can take to find a home, have it inspected, negotiate, close, and move in, two to three year orders may not seem worth it. For the past four years, my husband and I move, on average, every nine months. So for our military family, buying a home based on orders alone, is a terrible idea. But your situation might be different. If you have extended orders, reserve status, or retirement on the horizon then you might consider that it’s time to buy. If not, then you're probably not ready. But don't worry, you and I, and a lot of other families are in the same boat. 3) Your location isn’t ideal. Where are you stationed and looking to buy? Your location could determine everything. For example, if you're stationed at Camp Pendleton or the Pentagon, buying a home, although more expensive, will likely be easier to sell or rent out later--versus a rural area near a small military installation where you may have a more difficult time selling or renting when it’s time to move on. When you do decide to buy a home, buying in a heavily military populated area will greatly increase the probability for easy turnover should you choose to lease the property. 4) You don’t want the added responsibility when you move. You need to consider the full picture when deciding if it's time to buy. When you receive orders to PCS, will you sell or rent out the property? Selling wipes your hands of long-term responsibly but can be an added stress when you’re trying to PCS. And even though you can make money in the real estate business, renting out a home takes a lot of work and puts your finances at risk. If you don’t want the added responsibility of finding a good tenant and maintaining the property from afar, then buying a home right now is not in your best interest. For example, as I shared earlier, my husband and I move frequently. And while we’re currently located in a great real estate market, it's not time to buy because we know we’ll be here for less than a year. However, we do know that we’ll be at our next duty station for four to five years. Time to buy? Sadly, no. We’re moving to Hawaii, and when you factor in finances and added responsibility when we move, we know we’re not ready to buy. Even though Hawaii is dense with military families, the cost of living is exponentially higher than other locations. This means that not only would we struggle to find the quality of home we want, but we'd also be in a sticky situation should we fail to sell or rent out the property when we move back stateside. And even though we love the idea of owning our own home, it's simply a risk we aren't willing to take right now. Most of us are eager to get into a home we can call our own. You might even feel insecure as your friends are buying homes or investing in real estate but remember, each family has their own limitations and priorities. Do what’s best for you!